Deceleration rate, time to collision and impact speed have been commonly employed as accident risk indicators. However, it is hard to assess the level of accident risk since these indicators have not been developed with measurable score criteria. This study focuses on the determination of measurable risk indicators which could be used to assess accident risk level and to determine more appropriate accident risk management strategies by using the descriptive qualitative approach. The data were collected from a braking maneuver test conducted on a dry and level closed circuit course. Risk was a function of accident probability and its possible consequences, while accident probability was determined based on the safety factor, i.e. the ratio of available stopping sight distance (ASSD) to minimum SSD (MSSD), which was used to determine the margin of safety. Subsequently, accident consequence was determined using the impact speed at a predicted point of collision along the braking distance path. The results show that accident risk could be easily determined using the proposed indicators, whilst an objective and appropriate accident risk management strategy could be determined based on the minimum margin of safety value which could be obtained from each risk exposure. Although riding at an excessive and/or inappropriate speed (speeding) has been reported to be a factor associated with fatal accidents (WHO, 2008; DaCoTA, 2013), riders, particularly motorcyclists, have a tendency to increase their vehicle speed due to socio-economic advantages purposes (Chen & Chen, 2011). As the motorcycle is the primary means of transport in developing countries, particularly in Indonesia (Santosa et al., 2017), its risk should be the subject of in-depth investigation, mainly because its index of fatality tends to be constant, not only in developing countries such as Indonesia (da Costa, 2012), but also in European Union countries (index (200=100)) (Joshi et al., 2010). The fatality index (the ratio between the number of fatalities and number of accidents) in Kupang (the capital city of East Nusa Tenggara province, Indonesia) in 2011 was almost 80% (da Costa, 2012). Almost every day around 60% of motorcyclists have the tendency to increase their vehicle speed and exceed the speed limit in order to save time (41%) and for sensation seeking (19%) (da Costa et al., 2016b). Accordingly, it is understandable that accident risk management is top of the agenda in the Decade of Action (DoA) of Road Safety 2011-2020 (WHO, 2011). The Indonesian National General Plan of Road Safety (NGPRS) 2011-2035 was also published for the same reason, in which Road Safety Inspection (RSI) and Speed Management were also recommended as strategic agendas. However, Road Safety Inspection implementation has not been based on measureable criteria, so accident risk is assessed subjectively. Consequently, since the RSI results have been influenced by suitable inspection methods, such as the scope of inspected objects, the time period, and the duration of the survey, it is felt that its subjective recommended solutions are difficult to be implemented (da Costa et al., 2016c). On the other hand, exceeding the speed limit is common in Indonesia, but sanctions for the violation are never imposed. According to Nassar (1996), accident risk is a function of accident probability and its possible consequences. Some previous studies use the deceleration rate (DaCoTA 2013), time to collision (Lamble et al., 1999) and the safety factor (SF), i.e. the ratio between sight distance to stopping distance (Smith et al., 2013), as accident risk indicators. However, these factors have not been used properly in speed management devices, so the use of such SF models, such as the ratio between the available stopping sight distance (ASSD) and the minimum stopping sight distance (MSSD), has been recommended not only as an accident probability indicator, but also as a criterion of speed limit determination (da Costa et al., 2017). However, since the SF obtained was based on secondary data, particularly when determining the MSSD, the results have been accepted as alternative tools for accident risk reduction schemes. Consequently, in order to obtain an objective risk level, all input data should be based on measured data appropriate to the study location characteristics. To date, in order to calculate the MSSD for particular conditions, AASHTO (2011) recommends the use of a reaction time of 1.64 s, whereas Davoodi et al. (2012) found that this could be less than 1 s, i.e. 0.68 s. In addition, although previous studies have found that the braking deceleration rate could be greater than 4.5 m/s² (Fambro et al., 1997), i.e. 6 m/s (Malkhamah et al., 2005), or even 7.72 m/s² (Winkelbauer & Vavryn, 2015), AASHTO (2011) recommends the use of 3.4 m/s² to accommodate all types of driver. These differences indicate that there is a margin of safety (MS) in the SSD model. Consequently, if the speed limit is determined based on AASHTO’s recommended values, awareness of the differences in the obtained MSSDs might trigger a negative perception of the accident risk probability and/or consequences. Therefore, for accident risk analysis and/or evaluation, the calculation of an MSSD should take into account the effect of all possible factors influencing it, such as reduced speed due to downshifting, a minimum reaction time and a hard braking capability. It is predicted that a decrease in speed due to downshifting could reduce vehicle speed before braking, impacting it significantly. This issue needs to be investigated, as WHO (2008) reported that a decrease in speed of around 5 km/h could reduce the fatal crash probability by up to 20%. Other studies confirm that novice riders could increase their braking capability by up to 2.07 m/s² through short braking maneuver training (Winkelbauer & Vavryn, 2015). This clearly indicates that accident risk management schemes could be developed based on the SF and a MS obtained from the differences in their determinant variables. Furthermore, accident risk levels should be categorized clearly so that accident risk management and/or funding systems could be developed based on such an accident risk level hierarchy. There is an urgent need for this, because 7 years since the NGPRS was released not every province owns the Traffic and Transport Modes Board, which had been hoped to be the primary institution for managing the success of the NGPRS agenda. It is predicted that the lack of institutional arrangements in accordance with (DaCoTA, 2013), as well as the absence of measureable accident risk indicators, will be the main causes of road safety management problems. To cover these needs, it is necessary to improve accident risk management strategies by providing measureable accident probability, as well its possible consequences. Accident probability arises when a hazardous situation and/or object suddenly appears on the roadway. At an unsignalled intersection, this risky situation might occur not only due to the speculative behavior of a rider who has become impatient and has insisted on crossing the major road due to traffic delays (da Costa et al., 2016a), but also due to concurrent inappropriate speed choices of drivers. This sample case indicates that accident risk indicators should be developed based on the contextual risk conditions at each study location. Moreover, in Indonesia speed limits have been determined based on road function classification, land used and road geometric characteristics (Ministry of Transportation, 2015), whilst globally they are also determined based on traffic composition characteristics (DaCoTA, 2013). However, almost every day motorcyclists exceed these limits in order to save time or for sensation seeking reasons, believing in their braking capability (da Costa et al., 2016b). Since motorcyclists’ braking capability could be increased by up to 2.07 m/s² (Winkelbauer & Vavryn, 2015), it is thought that the awareness of this fact, obtained from riding frequency and/or duration of riding, could trigger risky behavior such as speeding. However, the correlation between riders’ mobility needs and their safety requirements should be studied in more depth, because it is believed that speed limit violations occur due to this unresolved conflict of interest. These phenomena strongly indicate that accident risk management needs to be improved. Moreover, in order to evaluate and recommend a more appropriate accident risk management strategy, the availability of measureable and objective accident risk indicators is an urgent and important need. Therefore, the aim of this study is to determine more appropriate accident risk indicators and to recommend a suitable accident risk management scheme. The availability of measureable accident probability (i.e. by using the ratio between ASSD and MSSD) and its possible consequences (i.e. by using predicted impact speed along the braking distance path, obtained from the relevant approach speed and hard braking deceleration rate) could be used to determine the accident risk level easily, as well as to recommend more contextual and objective solutions. 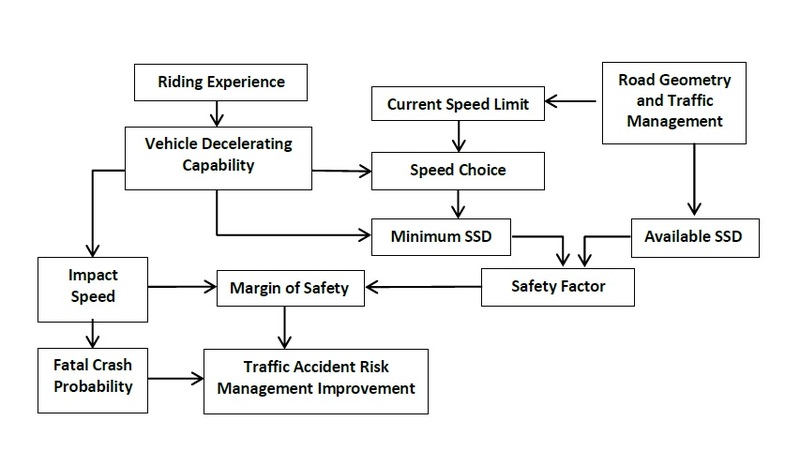 It is believed that the use of the proposed accident risk analysis model could not only minimize the subjectivity and/or uncertainty of results obtained from the previous accident risk analysis models, such as road safety inspection/audit (RSI/A) (da Costa et al., 2016c), but could also be used to determine appropriate accident risk management strategies and/or techniques. It is hoped that these objectives and the measureable model might also being adopted in other risk analysis approaches, depending on the risk conditions (risk indicators). Moreover, the results of this study could be used to support one of NGPRS’s primary aims, to provide better speed management guidance and its institutional arrangement. From the previous discussions, it can be inferred that the decreased speed occurring during downshifting influences braking distance and impact speed significantly, so that a combined effect of the use of minimum reaction time, and engine and hard braking deceleration rates influences minimum SSD dramatically. Therefore, the safety factor and minimum margin of safety obtained from the differences in rider braking capabilities could not only be used in accident risk analysis and/or evaluation, but also to describe both the accident risk situation and risk management strategy more clearly, objectively and easily. These findings confirm previous studies’ recommendations, i.e. that riders’ braking capability should be increased (Winkelbauer & Vavryn, 2015). This increase could be achieved by using the right type of braking and/or braking system (Bartlett et al., 2007). The implications are clear: (1) in order to obtain more appropriate speed management measures, such as future speed limit determination guidance, it is worth considering the effect of braking capability by using the proposed safety factor and minimum margin of safety models; (2) since such braking capability was determined because the pavement was in good condition, this clearly indicates that besides an appropriate speed limit, it is necessary to ensure that all risky road segments should always be in a well preserved condition; and (3) since braking capability could improve, and that this could reduce both the probability of accidents and fatal crashes, it is necessary to ensure that driving license processes should also accommodate braking capability in their knowledge-based training material and practical skill segments. The authors would like to thank the Indonesian Ministry of Research, Technology and Higher Education for the financial support through the “Penelitian Tim Pascasarjana” research grant scheme, and the “Yayasan Pendidikan Katolik Arnoldus (YAPENKAR) Kupang”, East Nusa Tenggara Province, Indonesia for the “Studi Lanjut” relief fund. We also thank the reviewers for their constructive comments.